Heres a little SOTD! I literally grabbed these trousers hoping I would fit them. I missed wearing my clothes when I was pregnant, then had to wait till now to start feeling confident in wearing them. They are rose patterned hareem style trousers from Matalan, teamed with a black vest top and black blazer. 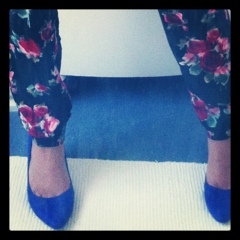 I then slipped on these electric blue heels from H&M £14.99!